Focus. That was my key for success in the 2014 75-Day Holiday Transformation Challenge. I have been attending Brien’s boot camps for over a year and challenge myself every day in class. The transformation challenge brought that dedication and work ethic outside of the gym, and that made all the difference. Nutrition, Nutrition, Nutrition. That is the key. I think everyone knows the basics but Brien and the team can show you how to make key nutritional lifestyle changes that are sustainable. Having a teaspoon of sunflower, olive, and coconut oil every morning/evening. Mentally making a note that fats are good for me and make me full. Eating Dale’s Bars when I needed them to not miss out on fats/meal. Work as a team. The coaches, family, friends, they all played a role in keeping me focused and encouraging me to succeed. Let people know your goals; they will keep you accountable and encourage you. Work hard, give it your all and enjoy it. I have never been a slouch at the gym but I learned how to push my limits to meet my goals. I learned to not be discouraged by folks not giving it their all; somehow it started to motivate me even more. I lost 17 .4 lbs and 6.3% body fat in 75 Days. I not only feel ridiculously strong, I feel balanced. Way better from when I was an athlete where I felt weak from cutting weight. Best shape of my life – balancing mental and physical fitness, I feel AMAZING. I travel a lot, 75% travel for work. People see me in the gym all the time, that’s because I was either working or working out during the challenge. On travel days I took every flight of stairs, parked as far as possible, did burpees every chance I had, shared my challenge story with everyone I worked with. That’s how I overcame this huge obstacle. There are no excuses; people make excuses, your body doesn’t. Stress. I have a very stressful job with a lot of responsibility. People sometimes see me blank out during workouts, that’s me thinking about work. I learned about mediation and breathing during the challenge. At every red light, I take a deep long breath. I try to sit for 5 mins every day and just breathe. That helped overcome stress and kept me focused. Naysayers: There were people that were skeptical about the challenge. I would hear: “Alex You look fine, you don’t need to lose weight, go ahead and eat this it’s not a big deal, you are not going to win because others have more weight to loose.” Non-sense, malarkey, hogwash. The irony was that most of the time the naysayers were out of shape and trying to give me advise for some reason. You can overcome it by listening to your coaches and those that truly support you. For the first time ever I feel balanced mentally/physically. I am in shape and don’t feel hungry or like I am missing out on life’s pleasures. It’s a great feeling. Simple carbs are over-rated. You don’t need them. I will never drink soda again; it’s horrible for you. Don’t do it. No-Carb/No-Fat is not the answer. I have done diets like that before and re-gained quickly. This time I focused on eating nutritious food that gave me a workout advantage and made me feel good. Yes, there were carbs and some awesome fats. That’s what made the difference. Thanks everyone! What an amazing journey. I look forward to encouraging others to challenge themselves and transform! Fit Body Boot Camp is the only group personal training program that’s fun, affordable, gives you fat loss results and challenges your body every time. Best of all, we guarantee you’ll be happy with the results or you get your money back. If you have questions or are looking for general information on our programs and services offered, complete the contact form below. Please provide as much information as possible in your message. If you would like a call back include your name, telephone number and the best times to reach you. We look forward to helping you complete your own transformation! FREE 6 WEEK MOVE & TRANSFORM CHALLENGE! 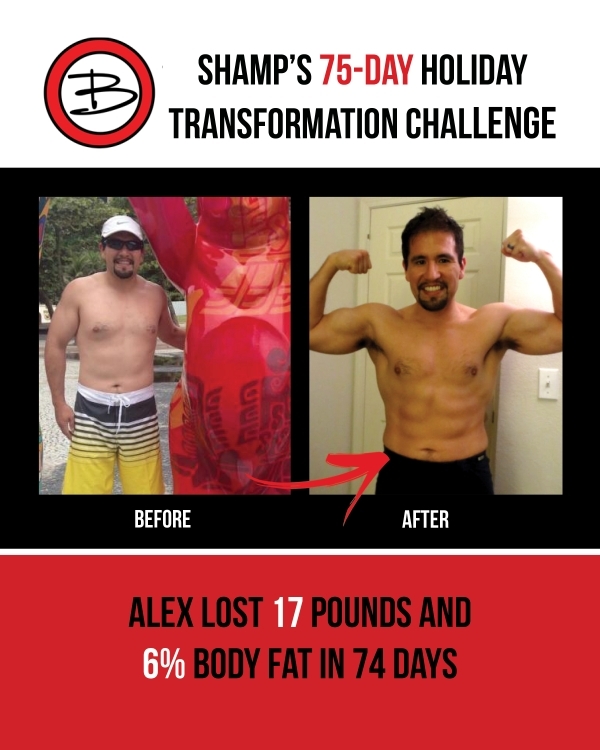 TRANSFORM YOUR BODY & LIFE IN ONLY 6 WEEKS! Brien Shamp's Fitness, Nutrition & Coaching is passionate about improving the Quality of Life of our coaching clients through Award-winning Group Personal Training, Cutting Edge-Nutrition and Transformative Life Coaching.